Ever wondered what it’s like to be micro-sized? 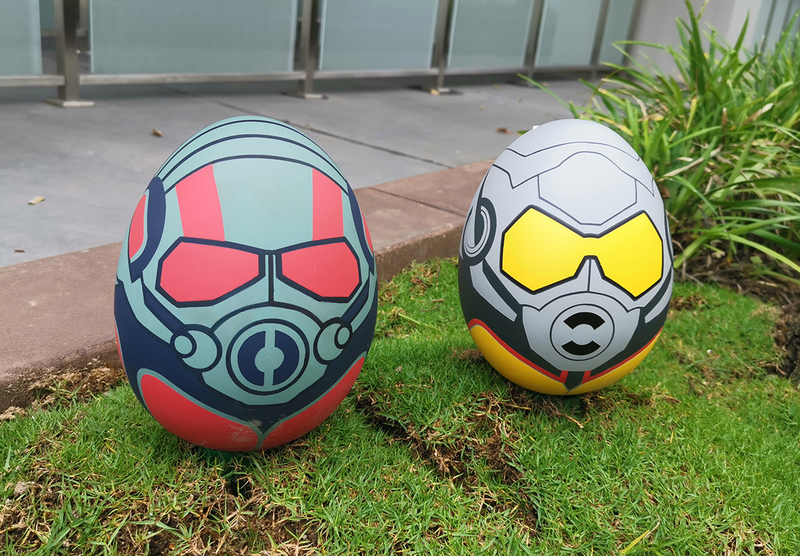 Now you can experience it with the launch of the latest attraction in Hong Kong Disneyland – Ant-Man and The Wasp: Nano Battle! from this Sunday, March 31! Ant-Man and The Wasp: Nano Battle! 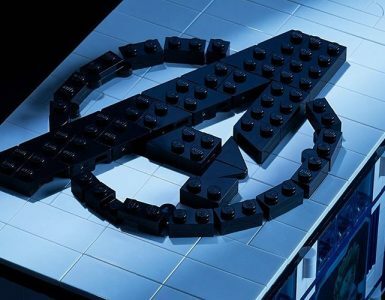 is an interactive adventure that will have visitors take part in a mini journey alongside Marvel Cinematic Universe’s smallest superheroes, Ant-Man (Paul Rudd) and The Wasp (Evangeline Lilly), who will be blasting and fighting nano-sized baddies together in an attempt to save Hong Kong. 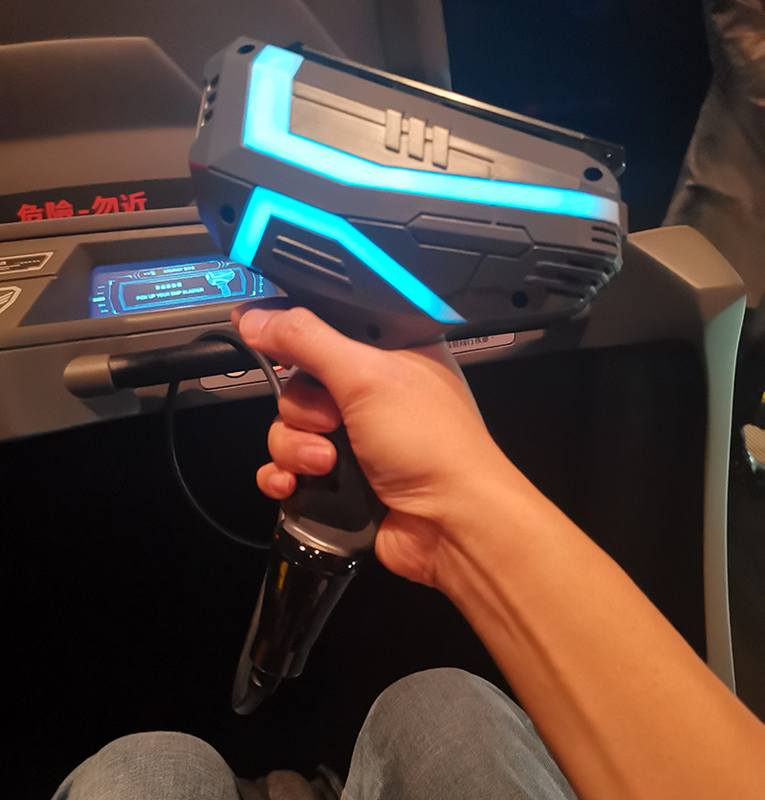 This ride is unique for two things: it’s the first-ever Marvel-themed attraction that features a female superhero as the titular character, and it will feature an all-new, all-exclusive Marvel Studios story featuring the two micro-sized Marvel superheroes, alongside Leslie Lam (Jessica Hsuan), the first MCU character based in Hong Kong. The Walt Disney Imagineers behind the ride, Dale (left) and Bryan (right). For those keeping score, Ant-Man and The Wasp: Nano Battle! 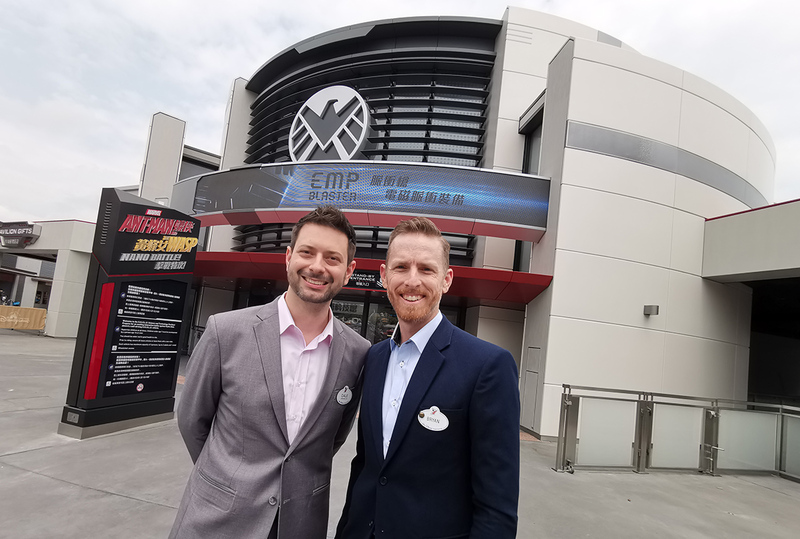 is the second Marvel-themed attraction in Hong Kong Disneyland, with the first being the amazing Iron Man Experience, which debuted in 2017. So while Tony Stark/Iron Man is staving off HYDRA-bots at the Stark Tower, Ant-Man and The Wasp will require your aid in defending the SHIELD Pavilion in Hong Kong against the attack of the evil HYDRA AI, Armin Zola, and his army of Swarmbots. After shrinking down with the two heroes, you’ll be embarking on an action-packed blitz to the SHIELD Pavilion’s Data Core in the D/AGR, SHIELD’s deadliest new combat vehicle, cutting a swath through the hordes of Swarmbots with your equipped EMP blasters. See if you can spot these adorable Easter Eggs! Fans will be shooting tons of flying baddies with laser guns while traversing on a high-speed micro-tank with Ant-Man and The Wasp flying and fighting alongside you and your friends. There’ll be plenty of quick jabs at the enemies, with tons of exclusive local Hong Kong references, so keep your wits about you as you fight alongside the two heroes. 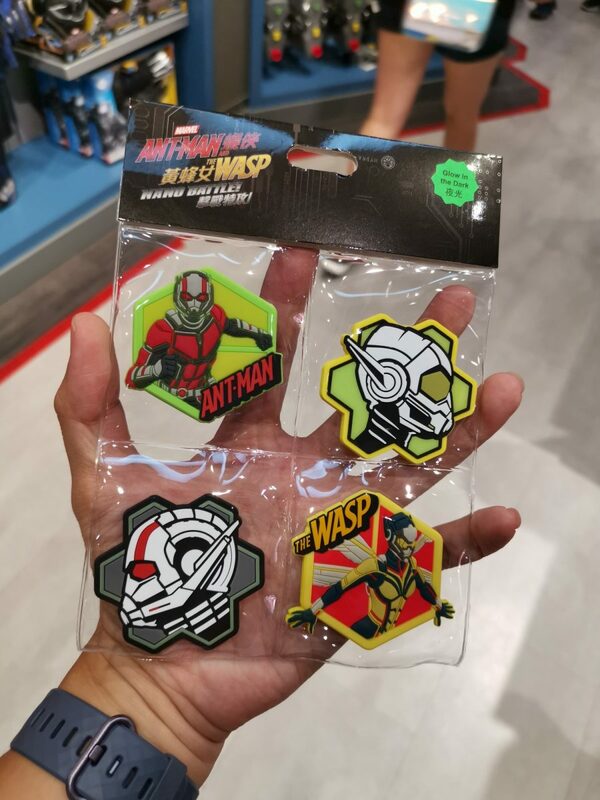 And once you’ve accomplished your mission successfully in the ride, head on over to Pavilion Gifts, the new shop in the north area of the SHIELD Pavilion, to purchase some swanky new Ant-Man and The Wasp, and SHIELD-themed swag. There are over 40 new items in the shop, so you’ll definitely have more than enough options to consider as memorabilia for this cool new ride. 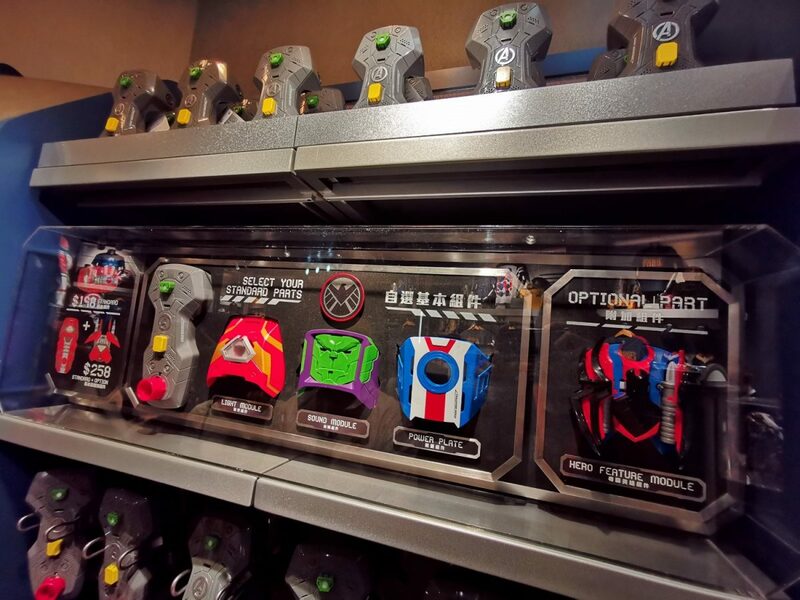 Exclusive to Hong Kong Disneyland, you can now build your own custom Avengers arm weapon. 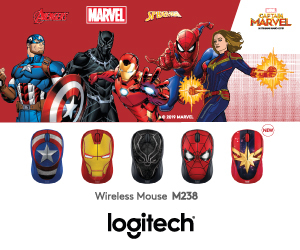 Choose from Hulk, Iron Man, Captain America or Spider-Man themed modules. You can never had enough fridge magnets. Gracing the launch of Ant-Man and The Wasp: Nano Battle! 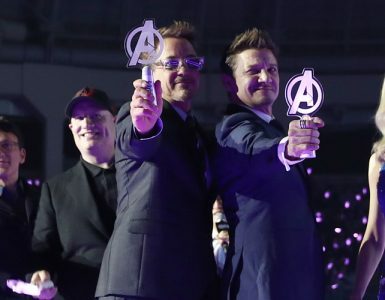 were Paul Rudd/Ant-Man himself, Marvel Studios President Kevin Feige, as well as Peyton Reed, director of both Ant-Man and Ant-Man and The Wasp. Watch the full launch ceremony, with a special message from Evangeline Lilly, who couldn’t make it to the event. 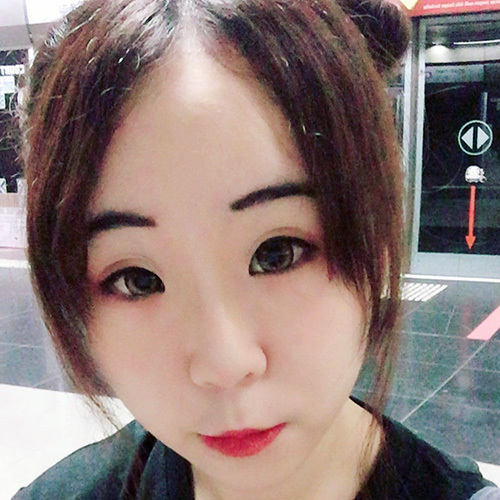 Jessica Hsuan, who plays as the Nano Battle! exclusive character Leslie Lam, was also present at the launch. 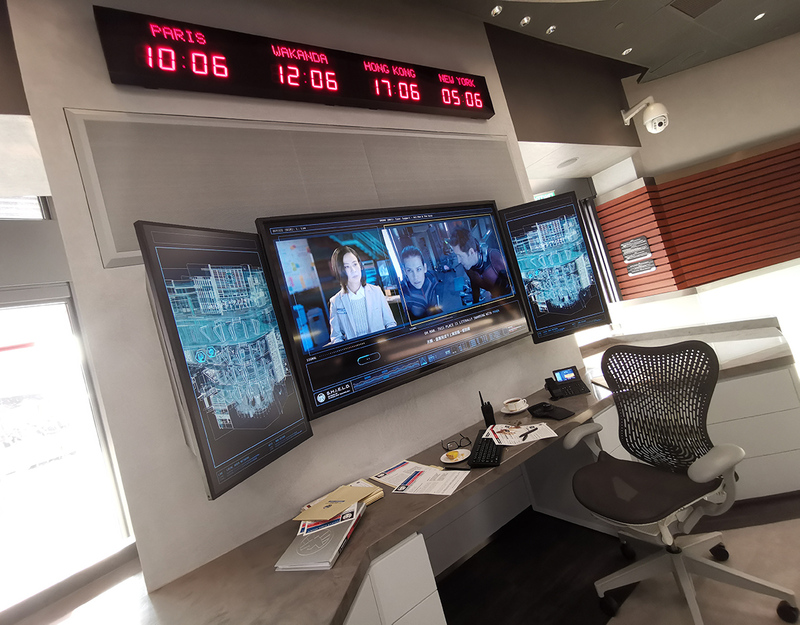 The renowned Hong Kong actress shared her excitement about being part of this “amazing” new Marvel Studios experience, and is genuinely thrilled “to have new local Marvel characters who truly represent” Hong Kong. 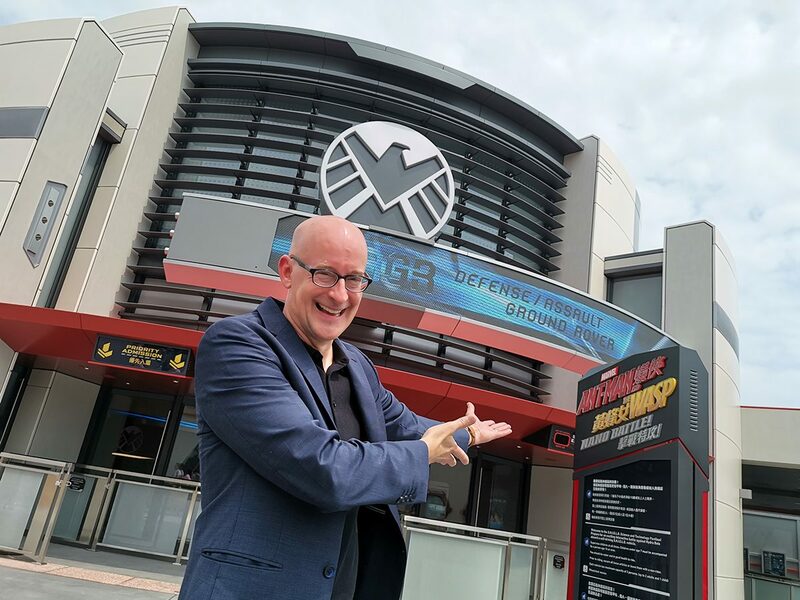 Director Peyton Reed can’t wait for fans to try the ride. With the cast and crew of Ant-Man and The Wasp: Nano Battle! being this passionate and excited about the ride, what’s there to get all antsy about? 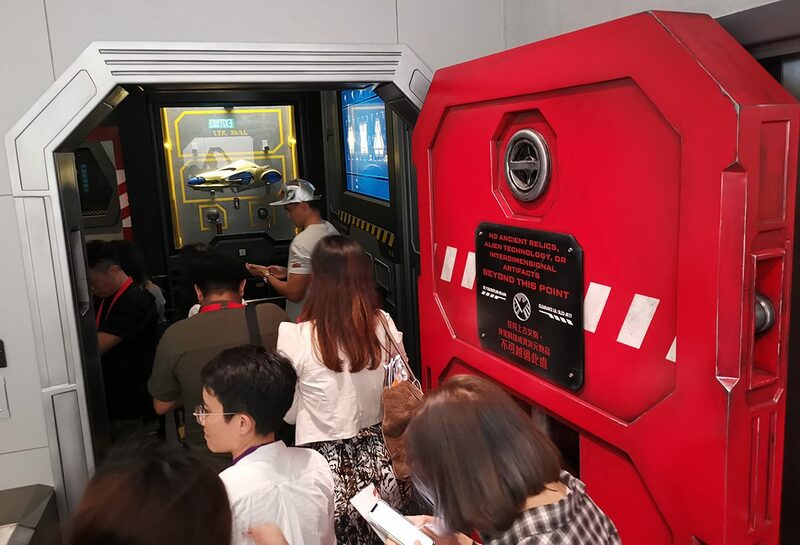 Right at the start of the queue line, guests are treated to a video console featuring a series of videos starring Iron Man, Ant-Man, The Wasp, and Leslie Lam, setting up the scene for the upcoming battle with Armin Zola and his army of Swarmbots. Now we know what timezone Wakanda is in. Paul Rudd says “thanks” in Cantonese. 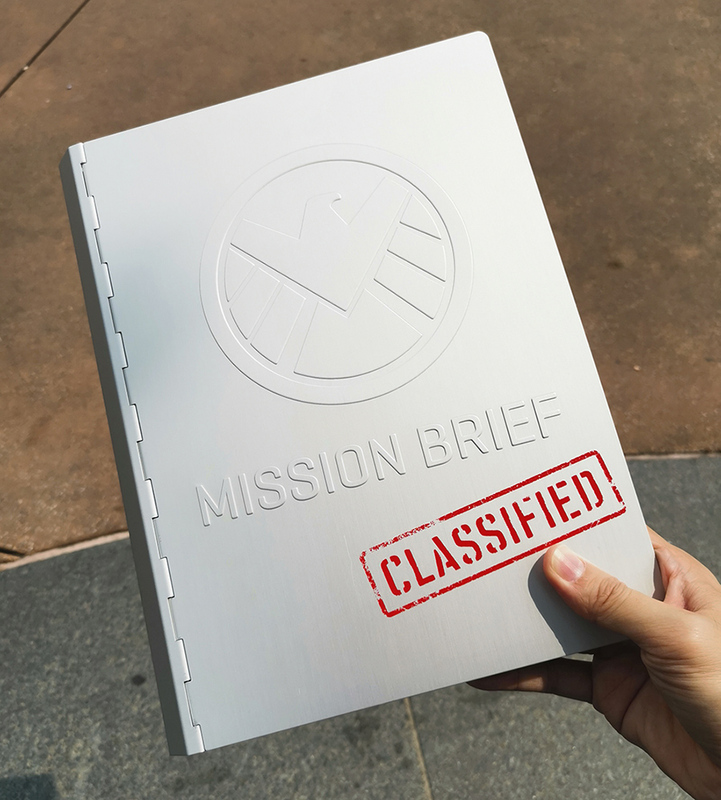 As the queue line continues, the guests proceed into the Secure Storage Vault where SHIELD stores 14 types of artifacts, weapons and research items from Marvel movies, TV shows and comics. 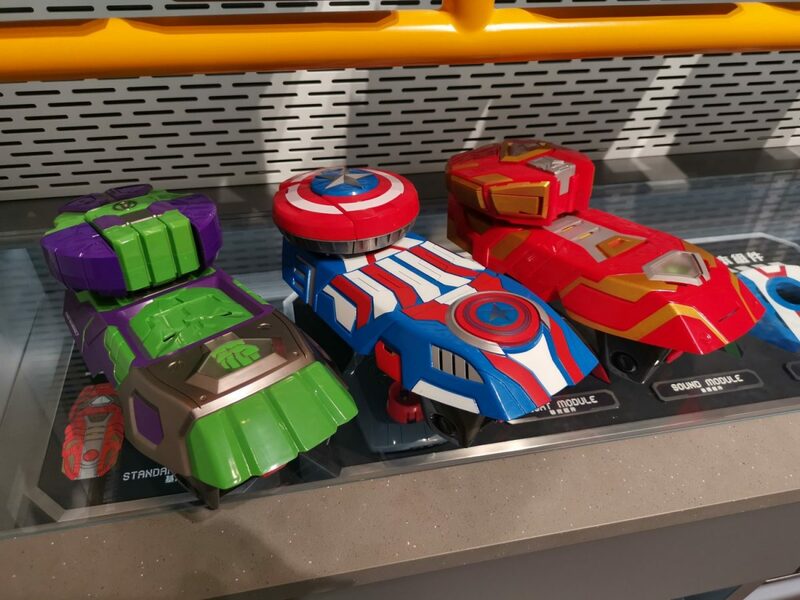 Some of these are unique and exclusively exhibited at Hong Kong Disneyland. Entering the Secure Storage Vault. 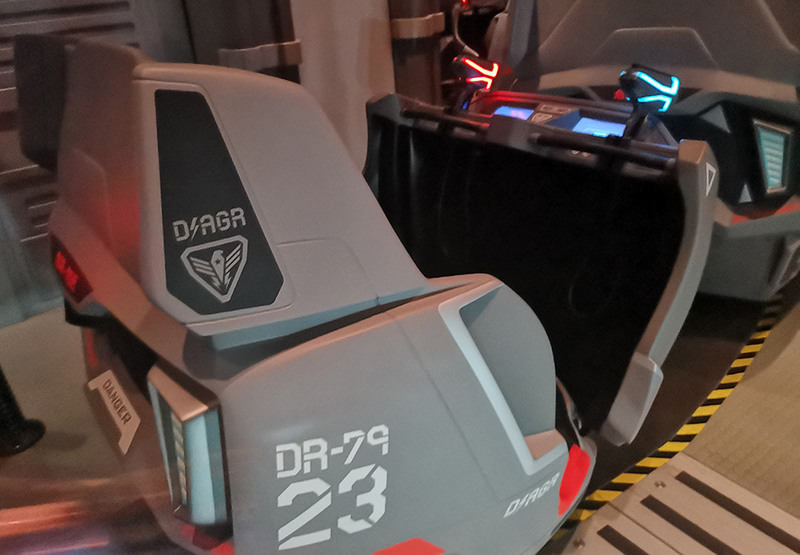 Upon exiting the storage vault, it’s already time to board SHIELD’s combat vehicle, D/AGR a.k.a. the Dagger, where guests will head deep into the Data Core to disable the Swarmbots using EMP Blasters. 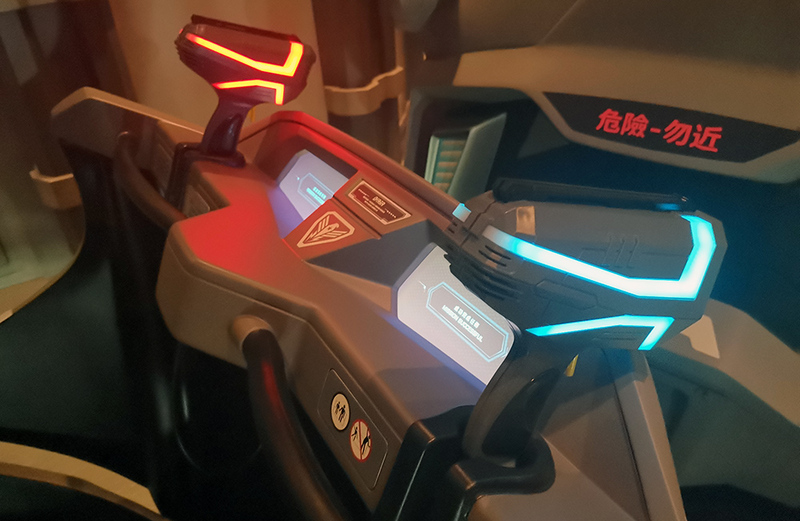 Each vehicle can take 2 riders at a time and is equipped with one blue and one red EMP Blaster, so take your pick. Armed with the EMP Blaster, it’s time to get trigger happy for the next 4 minutes, blasting away at 150 targets and competing with your friend to see who scores higher. Here’s a pro-tip, aim for the smaller triangle-shaped targets for higher scores. Curious to see what the ride is like? Have you tried the Buzz Lightyear Astro Blasters ride before? Remember how the new Guardians of the Galaxy – Mission: Breakout! ride in Disney California Adventure ride is a revised The Twilight Zone Tower of Terror experience? This is pretty much the same Buzz Lightyear ride, with a Marvel twist. The kids are gonna have a blast with it. And you gotta love the accuracy of the EMP Blasters. 4 minutes of Swarmbots disabling fun. 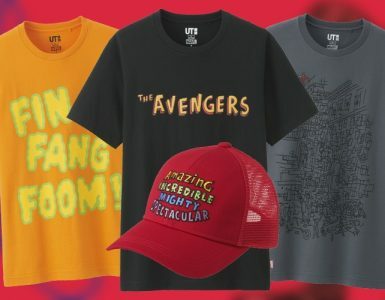 With this latest offering, we can’t wait to see what’s in store for Hong Kong Disneyland in the near future when they are expected to roll out their third Marvel-themed ride, which is currently in the works as we speak.